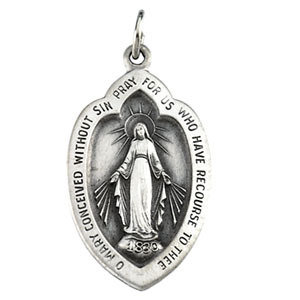 Many conversations revolving around religious jewelry are why exactly people wear it. I often read or hear about how it is a proclamation of one’s faith or beliefs or an attempt to openly demonstrate how godly they are. To me, it’s much more than that. Several years ago my mother-in-law passed away from cancer. As the disease progressed, she was placed in hospice care in her daughter’s home. It was a difficult period but being around loved ones all the time had to bring her some measure of comfort. Towards the end, she became worried, almost frightened. Worried as to how it was she was going to get to heaven. How she would find it. 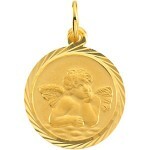 I picked out a small angel pendant and chain and gave it to my wife to give to her mom. When she placed it around her neck she told her that this was her angel to guide her safely to heaven when the time came. It was truly amazing to see the stress, pain and worry leave her face when she reached up and touched the pendant. It genuinely brought a feeling of comfort to her those last few days. So for me, religious jewelry goes far beyond the outward display of one’s beliefs of convictions. It’s what it does and can do for the feeling of comfort and well being of those wearing it. It’s what does and can do for the comfort and feelings of those who choose to give it to a loved one. I think that’s a good thing. My husband and I were sitting at the dining room table when he showed me his new sterling silver chain and medallion he purchased. The medallion was of St. Michael the Archangel. My husband said St. Michael is his favorite patron saint because of his role as warrior and defender of the family. I was surprised! I did not know he chose St. Michael. Yet, my husband has many of the same qualities as his patron saint he helps with the weak or sick, such as our elderly parents; his son sees him as champion and protector of our family; and he served fourteen years in the Army and Army Reserves; and, oh yes, he has a passion for collecting swords! Thinking about it, St Michael the Archangel is a wonderful patron saint for men and boys because he is a strong servant of God. Men often see spirituality as a “woman thing” and I think St. Michael goes a long way to remedying that! For St. Michael is no sweet cherub! In fact, traditionally known as commander-in-chief of the heavenly host, he is a strong warrior who presides on high. In the Bible, we find reference to St. Michael in the book of Daniel in Chapters 10 & 12. This reference to him is as “the great prince who has charge of your people.” (Dan 12:1). In addition, in the Book of Revelations, St Michael figures prominently in the Great War in heaven: “Michael and his angels fighting against the dragon; and the dragon and his angels fought, but they were defeated and there was no longer any place for them in heaven.” (Rev 12:7). Along with Gabriel, Raphael, and Uriel, Michael is one of the four Archangels revered in Christian tradition. Michael’s, name means, “who is like God” Traditionally, he is known as a divine messenger, a protector of the faithful, and the angel who guides our souls upon death. Usually depicted with a sword in hand, subduing a dragon or snake beneath his feet; St. Michael represents divine strength and courage in the face of evil. So, isn’t it natural that he is the patron saint of Police, Firefighters, Mariners, Paramedics, Soldiers, especially Paratroopers, and Security Forces. He is truly a saint of our times! 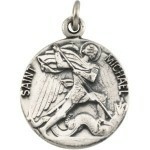 As I looked at my husband’s new medal and up into his eyes, I realized that it is natural that St Michael would be his patron saint. Those are the qualities that I fell in love with and why I married him. Those are the same qualities, which I will continue to love him for now and will forever! Isn’t it amazing what you learn about each other when you take the time to eat together! The author of this article is Terri Parker, owner of www.mycatholicsaints.com. Terri is currently working on her Master of Arts at the Athenaeum of Ohio: Mount St. Mary’s Seminary of the West in the Lay Pastoral Ministry Program.